Hand-built clay sculpture and storytelling serve as the portal through which the general public and I can explore humanity and theory-build together. In some instances, I use a mask’s face to liberate deep and complex messages from the Unseen. At other moments, I look at bottle trees and wonder if enslaved African people once hung glass bottles in tree branches to memorialize ancestors, while simultaneously documenting their family history. 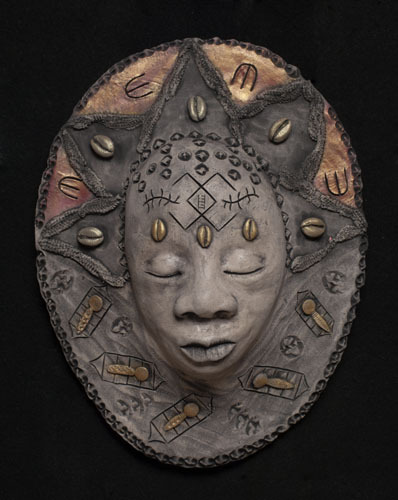 And, still, at other times, West African akua’ma figures help me embrace the power and resiliency many Africana women exude so I can examine the relationship between the seen and unseen. In my work, I blend textures, glazes, stains, and post-fired finishes to explore a piece's aesthetic power. I, also, rely on Akan adinkra symbols to address questions of meaning and purpose. Through the process of research, analysis, reflection, and creativity, I, respectfully, come to the clay as teacher and student to discover the contribution I am meant to offer humanity.